Heavy Metal Vocalists of all time. 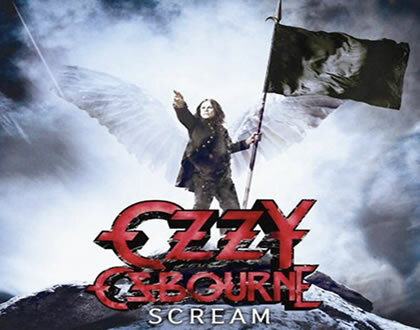 Scream is Ozzy Osbourne's first album in three years and 10th studio album overall. The album was produced by OZZY and Kevin Churko, both of whom did the same honors for OZZY's 2007 worldwide million-seller Black Rain, the album. The multi-platinum, Grammy Award-winning, Rock and Roll Hall of Famer recorded most of the album at his Los Angeles home studio, The Bunker, and co-wrote all the songs, primarily with Churko. Notably, the album marks the first appearance of OZZY's new guitar player, Gus G. OZZY's band also features bassist Blasko, drummer Tommy Clufetos and keyboardist Adam Wakeman. This is Osbourne's first album of original material to not feature lead guitarist Zakk Wylde since his debut on the 1988 album, No Rest for the Wicked. Playing guitar on this album is Firewind guitarist Gus G., and playing drums is former Ted Nugent, Rob Zombie, and Alice Cooper drummer Tommy Clufetos. Scream was originally titled Soul Sucka but Osbourne decided against it after negative feedback from fans. Ozzy has stated that this album reminds him of an "Ozzy/Black Sabbath" album. The first single from the album, titled "Let Me Hear You Scream" debuted on CSI: New York on 14 April, and has since spent 8 weeks on the Billboard Rock Songs, peaking at 7. 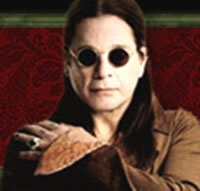 To promote the album, an Ozzy Osbourne track pack has been released as downloadable content for the Rock Band video game series, containing three Scream songs and three of Ozzy's greatest hits. "Let Me Hear You Scream", "Soul Sucker" and "Diggin' Me Down" were released alongside "I Don't Wanna Stop", "Crazy Babies" and "No More Tears" on June 15, 2010. 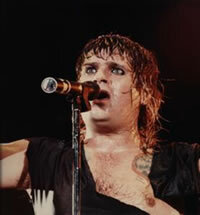 Other promotions used to advertise the album include the stunt at the Los Angeles Dodgers vs. Los Angeles Angels of Anaheim MLB game on 12 June 2010, in which Osbourne encouraged the crowd to scream the word "Scream" as loud and as long as possible. The goal was to earn the Guinness World Record for loudest and longest scream from a crowd, and it was met successfully. Although the official decibel level has not been announced, the stadium beat the previous record set by a group of Finnish Boy Scouts, which was 127.2 dBA. The money earned was donated to ThinkCure! to aid cancer research. Osbourne has also premiered on many new commercials, video games, albums, etc. to help raise awareness of the album. Ozzy also stashed a little "secret art" on the booklet and tray insert are sketches of what seem to be the Devil, some type of aliens, and what is believed to be Ozzy himself. The pictures and drawings are only visible when a light is reflected directly off them. In 2009 it was announced that there would not be an Ozzfest 2009, but that Ozzfest would return in 2010. Osbourne performed at the gaming festival, BlizzCon 2009. Osbourne provides his voice and likeness to the 2009 video game, Brütal Legend, where he stars as The Guardian of Metal. Slash's song "Crucify The Dead" features Osbourne on vocals. From the Scream album, "Let Me Hear You Scream", debuted on the April 14, 2010 episode of CSI: New York. On April 13, 2010, Ozzy says he is looking forward to the return of OZZFest for six dates this summer and is also looking at an 18-month world tour to promote his new album, "Scream." Visit artist website at www.ozzy.com.